In the UK, there is an increasing emphasis on teaching and encouraging British Values in schools. 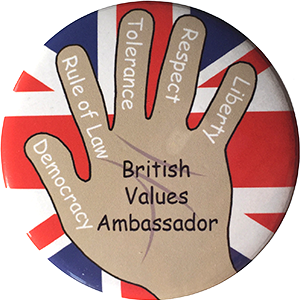 As such, we now offer badges that depict the fundamental British Values according to Ofsted. Customisable with your school’s name, this badge design helps with the easy recall of the core British Values. It is ideal for children who have been named the British Values Ambassador for their class or year group.